wow this realy stirs up memories .I remember my mother getting some black cat shag for my uncle,and we were always made to stand outside. Does anyone know what happend to the scotsman? In Broad Row nearly oppsite the tobaccnists was a cooked meat shop I think it was Sennets bacon & ham & pies it shows how memory can serve it was just before or on the out break of the 2nd World War, when my mother & I went shopping there as rationing came in the shops like Sennets seem to close down does any one else remember it? Recently i went to a old Priory boy's & girl's reunion at the priory hall old school. When I was there a woman came up to me & ask if I remeber her. It came about she was Teddy Spurgeons youngest daughter sad to relate her mother & Teddy & her older sister Maureen had passed away. Earlier in the same year I was in Yarmouth and on the area of Nicholas Road & saw the boarded up run down old newspaper shop that Teddy had. It was very sad to see. Most of my old mates & I were paper boys for Teddy. Maureen worked in the shop. Being near the old Beach railway station Teddy done a great trade on the Buckets & spades & beach toys plus the early morning news paper. Moving on later in the year I went past the same area only to see a builders have pulled down the shop to build a flat on the site. I know its progress and it's sad to happen but we old paper boys still have our memorable times of Teddy Spurgeon. I do hope that any friends of Teddy's daughter read this article and put us in touch or look out for the next reunion. Thank you Time & Tide for this web site. It helps us ex pats. Thank you for putting in this photo. My godmother used to work in this shop and when I visited my grandparents in Great Yarmouth it was lovely to go to see her in the shop. 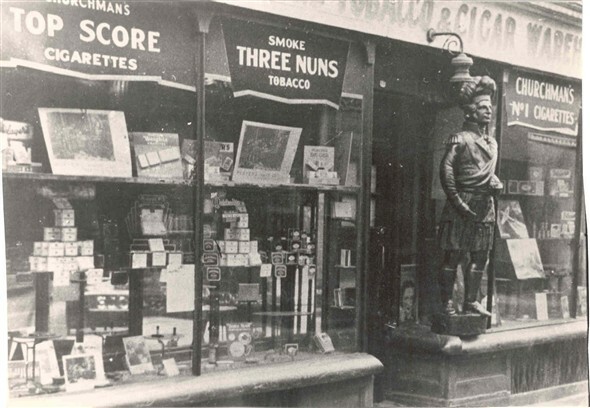 I can remember the distinct smell the shop had due to the tobacco, cigars and pipes they used to sell. I loved walking in the 'rows' and round the market which I believe was Wednesday and Saturday where my Mum's uncle had a stall. I can't remember what he sold on the stall. My grandfather John Layen was the manager of Norton's wholesale warehouse and he used to travel all over Norfolk and Suffolk delivering sweets and tobacco products to all the small sweet shops. Obviously I was able to have a few 'samples'.